Among the best outboard fishing boats ever produced, the 272 Sailfish is a redesigned version of the company's popular 255 Sailfish (1981-93) with the integrated transom, minor interior modifications, and a redesigned bottom. Heavily built, the 272 Sailfish was one of Grady's best selling models. A wide 9'6" beam provides more usable cockpit space than many 27 footers, as well and a reasonably roomy cabin. The side decks are wide enough for easy bow access, and a deep cockpit keeps everyone secure when the going gets rough. Standard features include a bow pulpit, 20 gallon aft live well, rear bench seating, cockpit bolsters, transom door, deluxe helm seats, raw water wash down, transom shower, trim tabs, rod storage racks, and a hard top. 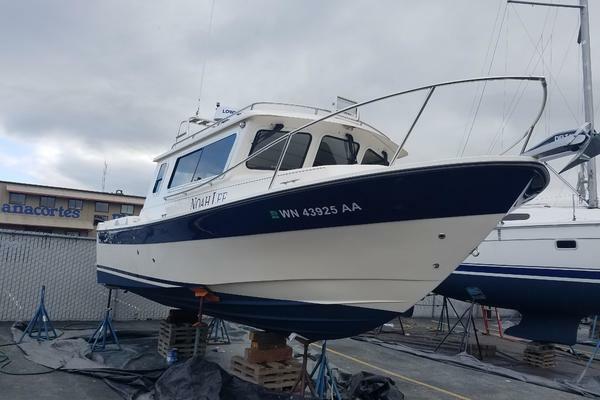 Below deck is a functional cabin with the mini galley, enclosed head and shower compartment, athwartships aft berth, and convertible dinette/V-berth forward sleeps 3-4 people. Close to 40 knots with Yamaha 200 outboards. This boat also has new canvas, cushions and Eisenglass. The owner is very motivated to move this boat. West Florida Yachts would love to guide you through a personal showing of this 27' Grady-White Sailfish 272 2000. This yacht for sale is located in Stuart, Florida and priced at $29,850. For a showing please contact us by filling out the form on this page and we will get back to you shortly!